Reaching its second day on Friday, the wildcat strike and picket at the School of Oriental and African Studies was successful in putting further pressure on management to lift the suspension of union representative Sandy Nicoll. The suspension comes in response to Nicoll’s alleged support for the occupation there and its resilience against increasing repression from university management. Two days ago director and former cabinet member Valerie Amos escalated the situation by disconnecting electricity and bodging the air conditioning, and employed seven security guards to prevent people entering the occupation. Rallies of around 350 students, workers and academics have escalated support for the occupation and workplace struggles at the university. That management have targeted a worker and union representative without disciplinary procedures for occupying students or academics highlights the classed respectability afforded only to the second group. Time and again, radicals are protected and limited by their student identities – for which the political game must be played along the specific lines of “respectable student activism”. In a neoliberal world, students are both raw material and active participants in the University’s institutional power. The call for student-only self-organisation within predominantly middle-class, Russell Group universities limits the free education movement to those whose interests necessarily overlap with management’s. The University must produce professional “members of society” as much as individuals require profession to continue or qualify for this membership. Strained by uncomfortable common interests with management, many free education campaigns reproduce the system they seek to dismantle. Here student self-organisation becomes “student identity”, the “student community” or the “Student”. Armed with this single-issue politics of single-characteristic communities, these campaigns act more for public perception than the struggles of those for whom the university is more vital than a degree. These campaigns have no interest in liberating the education of the everyday: the housing struggles of the poorest students, workers’ struggles or resistance to racist and classist state violence. The rhetoric of “student identity” or “student community” politics distances itself from these other struggles – despite employing similar claims for basic conditions of living against the tyranny of market control. Free education in a capitalist world might be a lecture hall in a prison; but in today’s society of control it is a leaflet table of HMP’s theories of justice. To pose a challenge to power, free education struggle must both champion and come from those educated in lived resistance. Some of London’s most populous universities, such as London Metropolitan, Southbank or Kingston, are predominantly working-class. Many of the secondary school and sixth-form militants of the 2012 anti-fees protests are now sitting in their seminars. For them and those who did not “escape” their estates, free education must mean more than “no fees” or “course cuts”. The liberation of education from the University will find its power in their informal knowledge of working-class experience. It will come from those the University was designed to erase and discredit. 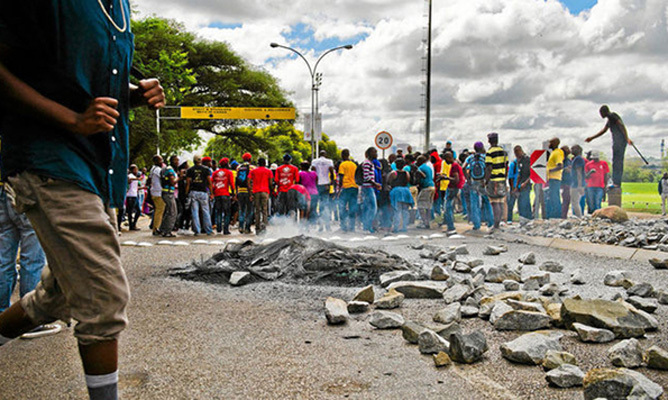 Anarchist activity in the ongoing South African student protests can be seen as an attempt to create student activism inseparable from anti-imperialism and anti-capitalism. Statues of old colonialists, such as Cecil John Rhodes at the University of Cape Town, are pulled down. Student members of the Zabalaza Anarchist Communist Federation (ZACF) point to the marked intersection between race, class and profession within neoliberal South Africa. For years previously, ZACF student members hardened their shoulders during actions and assemblies of the Anti-Privatisation Forum (APF) and the Landless People’s Movement (LPM). Both the anarchist activity in South African universities and the mass walkout and pickets at SOAS have an immediacy and militancy incompatible with “respectable student activism”. 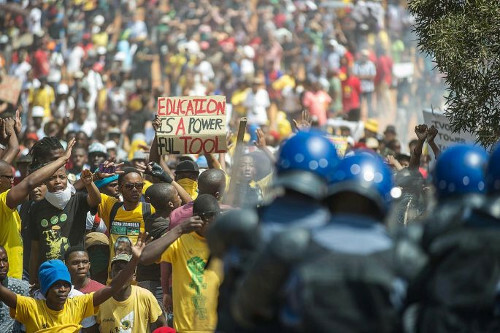 Radicals at the University of Durban Westville, the Witwatersrand and Cape Town resist the repression they have always experienced as necessities of their race and class. 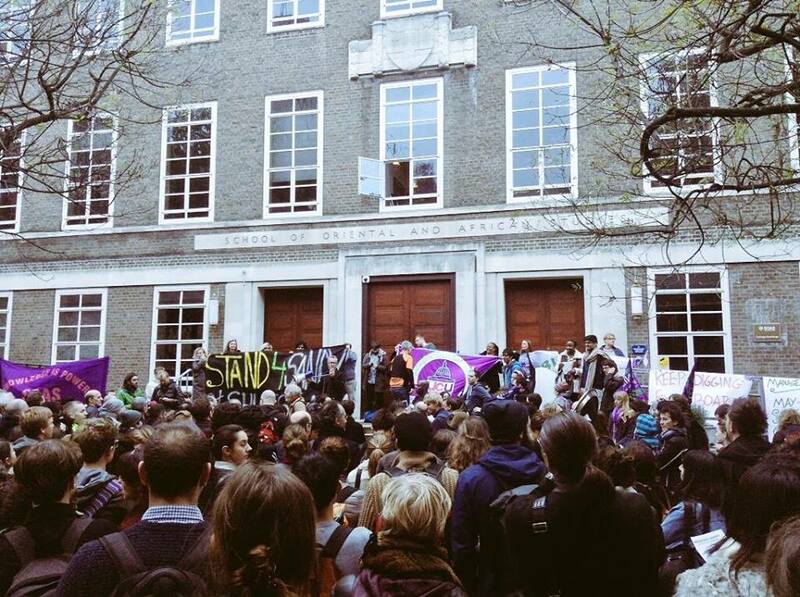 On a smaller but similar basis, the fight against Nicoll’s suspension is for his employment and conditions of living and those of workers at SOAS. Here free education becomes an extension of larger resistance fuelled by the education of the everyday. The identity found most antagonistic to management is not the “student” but identities more complex and applicable to those outside the University. Experience of resistance in estates, workplaces or townships is the basis for political action because these politics are enacted by those already thrown into resistance.